133 pages, illustrated, 8 �" X 11". This book provides a thorough engineering analysis of the vacuum tube Class C continuous wave RF oscillator. Also addressed, within the framework of traveling wave engineering, is the open helical resonator as developed by Nikola Tesla in the 1890s. 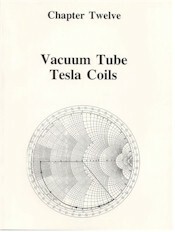 In addition to a brief history of resonator and particle accelerator development, the book also contains 6 useful appendices that can be of value to the Tesla coil builder.